WE human beings are accustomed to see the interaction between predator and prey in moral terms, but this view is of little value. Darwin’s famous definition of survival of the fittest is far more applicable than the type of moral considerations often imposed on natural events. What the moral view fails to see is the fact that both predator and prey benefit from the relationship in a balanced ecology, and that the system often operates in the best interests of both species. All animal life, in one way or another, is dependent on plants. Only the plants can make the complex carbon molecules, the sugars and the amino acids, that are required for life. Many animals feed wholly or in part on plants, while other animals eat the plant-eaters. Because of the relationship between plants and animals, the meat-eaters have much more limited supply of food than the plant-eaters and there are therefore fewer of them. This general rule can be seen in operation in many different types of habitat. Every fisherman knows that while there may be many tiny minnows in a river, there are likely to be few large pike. The predators, in other words, tend to come at or near the end of a food chain, where much of the energy originally taken from the plants eaten by the plant-eating animals has already been spent on keeping the plant-eaters alive. An additional reason is that the predators must not eat all their prey — if the pike were to eat all the minnows, no more minnows would be reproduced and the pike would rapidly die of starvation. These basic considerations, then, condition the relations between predatory animals and their prey. No predator can afford to exterminate the whole of the species it preys on without undermining the condition for its own existence. At the same time, the predatory animal must be able to catch sufficient of the prey to remain alive, and for this may require certain special attributes to enable it to make sure of catching and eating enough. For these reasons, predators are generally larger than their prey, although this is not an invariable rule, and they tend to be isolated animals rather than vast flocks or herds. 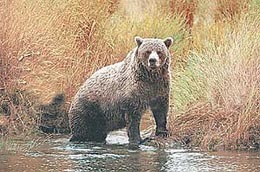 It is estimated, for example, that there is only one grizzly bear to every 40 square miles of the Canadian Rockies. Like many other predators, these animals tend to be solitary in habit and highly jealous of their territory and guard it regularly against intrusion by any individual of their kind. Predators also need to be specialised in their hunting ways. In many cases, like the predators which feed on the giant herds of antelope in the African veld, their prey is fast-moving and congregates in herds for protection. In such situations, predators must be able to stalk their prey so as not to give a warning of their presence and to be able to catch the prey on the run. Predators must also be able to eat their food after they have killed it, and for this they require specially adapted teeth and jaws, beaks and talons etc. Animals belonging to the dog family have well-developed canine teeth for ripping the flesh of their prey and powerful jaws for cracking its bones. Not all carnivores are solitary animals; some have evolved the social mechanism of the pack to help them to catch and kill their prey. The dog family is an example, and wolves frequently hunt in packs, enabling them to bring down animals larger than themselves, extending the scope of their predation.